Steve and I were going to an informal surprise birthday gathering later that evening, so our options for a quick bite were limited. Luckily, White Oak, which was across the street from the Hyatt, was able to seat us immediately. White Oak serves modern Southern cuisine. We started with salads; I had the beet salad ($11) that my friend Cristal raved about. 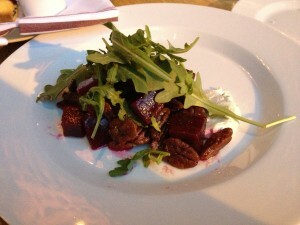 It was a beautiful plate of generous cubes of roasted beets, arugula, spiced pecans and herbed goat cheese. 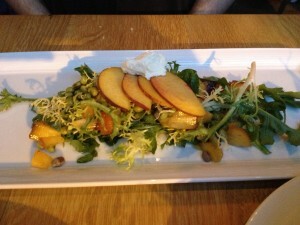 Steve enjoyed a salad of Georgia peaches, arugula, lentils and chevre ($11). 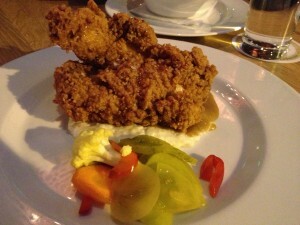 We shared the honey fried chicken entrée ($18). It was served with green garlic grits, red eye gravy and pickled vegetables. The chicken was moist and I enjoyed the honey flavor, but the breading was too thick. The crust was they kind you worry about chipping a tooth or cutting the roof of your mouth. I assume they double bread and there is just no need for that. The grits and gravy were excellent and the pickled vegetables added much needed acidity to the dish. 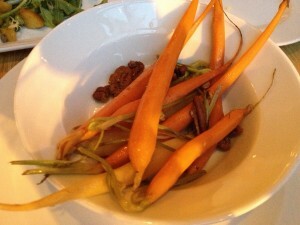 I really loved the roasted carrots we got as a side dish, as well. We were not going to get dessert but when I glimpsed the salted pecan caramel ice cream ($4) on the dessert menu, I couldn’t resist. It was a generous portion – two large scoops, but the ice cream was overwhelmingly sweet with no hint of the promised salt. I enjoyed my cocktail. I got the home made berry lemonade with vodka. It was sweet, tart and refreshing, perfect for a hot Atlanta night. This is the last of my Atlanta posts. I did eat at the food court at Peachtree center a lot between bridge sessions, but none of my meals were blog-worthy. I wish I had had the time hit Bacchanalia or Miller Union, both very highly regarded, but there wasn’t enough time. I’m sure Nationals will be back in 7 years.